Do you remember the old song “Paper Roses?” Since I was a little girl I have been sort of obsessed with paper roses and recently I came across these gorgeous roses that you can make from old book pages. These are so lovely and can be used in so many ways to create so many gorgeous things. If you want an easy craft, this is it. 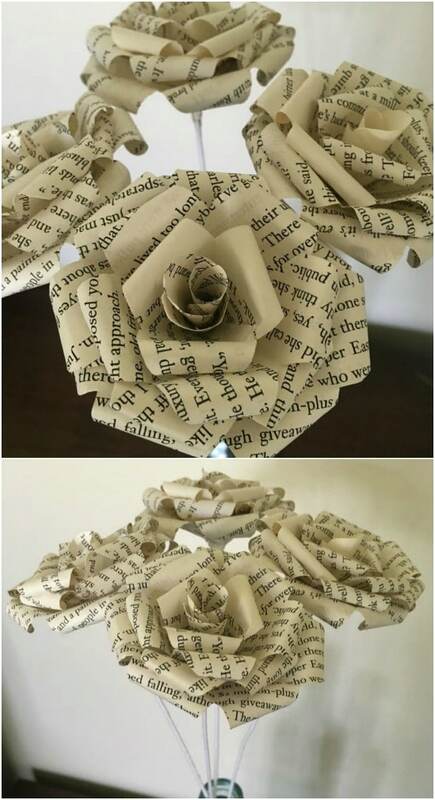 It’s also a really cheap one because you can make these roses from those old books that you would otherwise throw out, or head off to your local thrift store and just buy some old books. 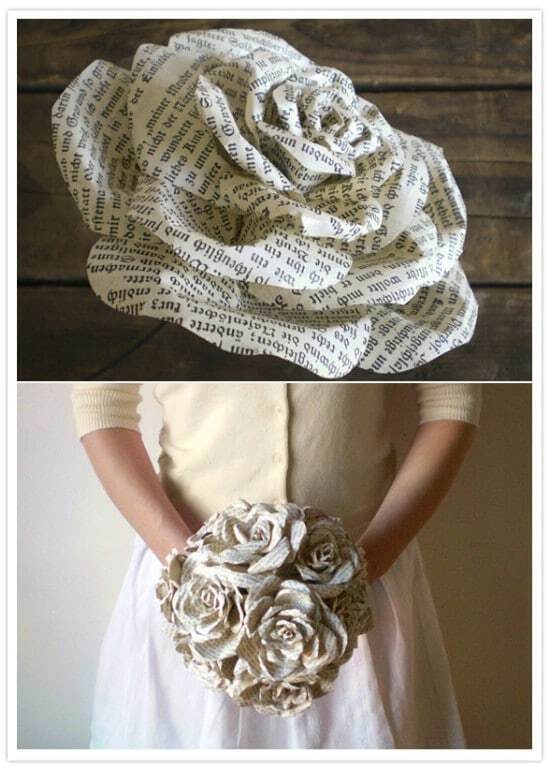 The appeal of book paper roses is that they have this gorgeous old world look to them. The roses themselves are pretty enough but when you add the wording from your old books, they are simply unlike anything you have ever seen before. I am a huge lover of books and have so many on my bookcases, so these really appeal to me. Anytime a book is involved, I’m hooked. And, I should mention that if you have tons of books and you don’t have anywhere to keep them, I have a great list of 20 DIY bookshelves that you can build in no time. 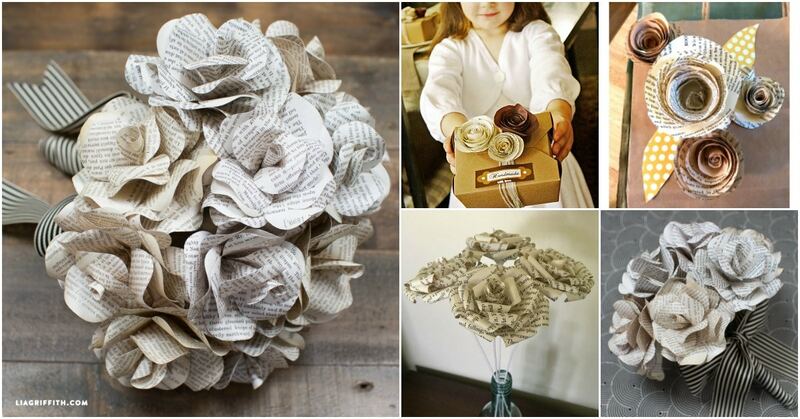 Honestly, these DIY book page roses are gorgeous and you can use them in any number of crafts. Are you making a new picture frame for your favorite family photo? Add a DIY book page rose or two to really make it beautiful. You can use these to decorate wreaths, gift bags and just about anything else you can imagine. And, you make them from upcycled old books so you aren’t spending anything on craft supplies. 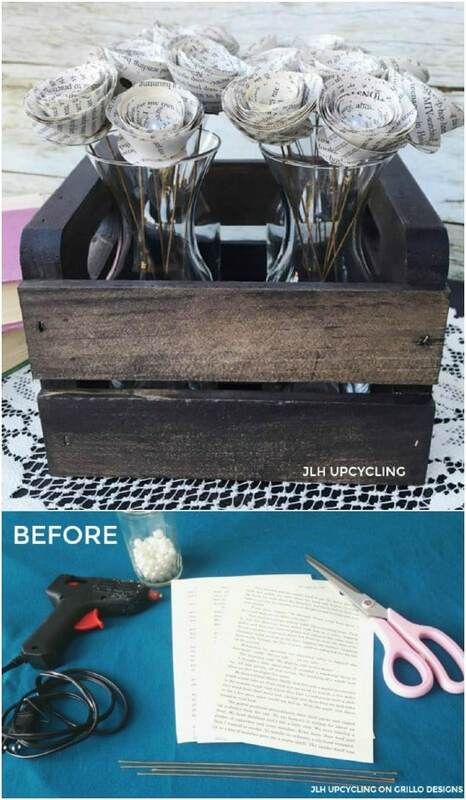 If you truly love repurposed craft projects, this one is for you. And be sure to take a look at these 20 ways to recycle old board games, too. These roses are made by curling each individual petal, which seems time consuming but once you really get the hang of it, you will be making a rose in just a matter of minutes. You do have to cut out the petals individually and then roll them to give them the look of a true rose. These are pretty simple once you get started and you can turn out an entire bouquet in just a couple of hours. To make these vintage book page roses, you just need the book pages, scissors and a hot glue gun. These are absolutely gorgeous and can be used to decorate so many different things. I love how easy they are to make and they are perfect for creating your own DIY gift bags. Plus, you can add scrapbook paper or painted book pages to create the leaves, which gives them a completely different look. You could even add these to your DIY tote bags to give them extra design. For these lovely DIY book page roses, you don’t so much roll the pages as you just cut out the sizes that you need and then stack them up to make them resemble a rose. This one is also really easy, even if it is a bit more complex than some of the others. You need glue to stick the pages together and otherwise, this one just takes a couple of old books and some scissors. You can create a beautiful display of flowers with these DIY storybook paper roses that you also make with grosgrain ribbon. The entire look is one of a fairy tale and this one is perfect for adding some design to your little girl’s storybook bedroom. It’s also great for decorating for a princess birthday party, and they don’t take long at all to make. 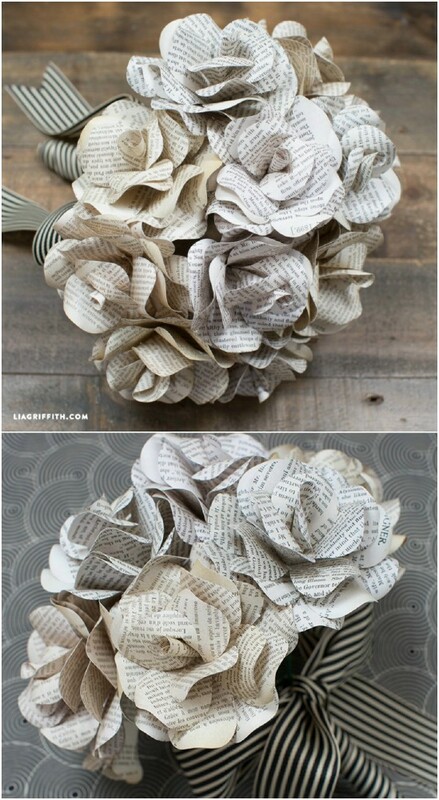 You don’t necessarily have to use old books to make your paper roses. You can also make them out of old sheet music. This is a great project for those of you who love music and these little roses are super easy to make. If you don’t have sheet music that you can use, check with your local thrift store. They typically sell sheet music for just pennies. Not only can you make gorgeous paper roses from old books, but you can make them glittery, too. With just a bit of school glue and your choice of glitter, you can create the most amazing roses that can be used to decorate so many things. Add these to your DIY Easter wreaths or homemade gift bags, or you can make an entire vase of story book paper roses to give as a gift. These beaded book page roses are perfect for a wedding bouquet or to decorate the tables at your wedding reception. You add pearl beads to the centers of the roses to give them a wonderfully decorative look. You could even add colored beads if you wanted to match a specific color scheme. These are super easy to make and they’re perfect for your wedding decorating. 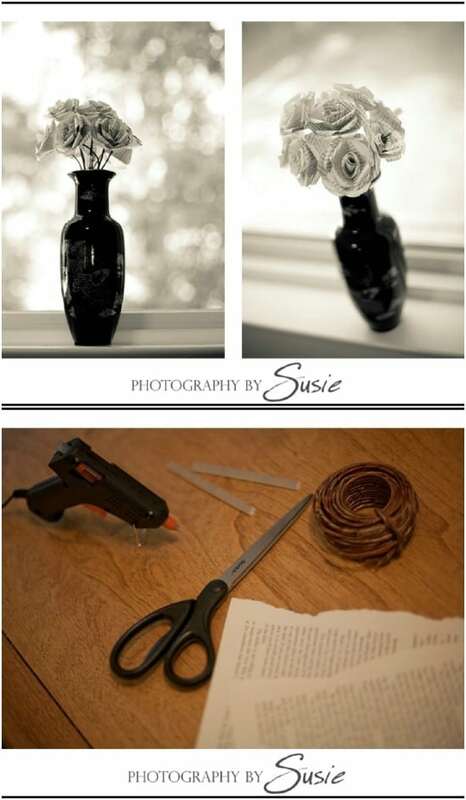 You can add these rolled book paper roses to anything that you want to decorate. 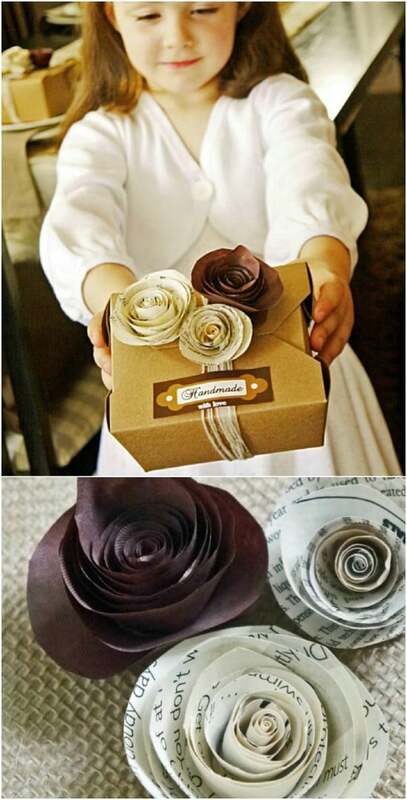 If you are giving out boxed baked goods as a gift, paper roses are a wonderful way to decorate the box and you can add in some colored roses made from craft paper to give it an even more decorative look. These particular book paper roses will take you a bit longer than some of the others to make, but they are definitely worth the extra time. You have to cut out the petals instead of rolling these but once you get all of your pieces cut out, these really are not that difficult to put together. And, they look so authentic. If you want paper roses that really resemble real ones, these are definitely worth checking out. 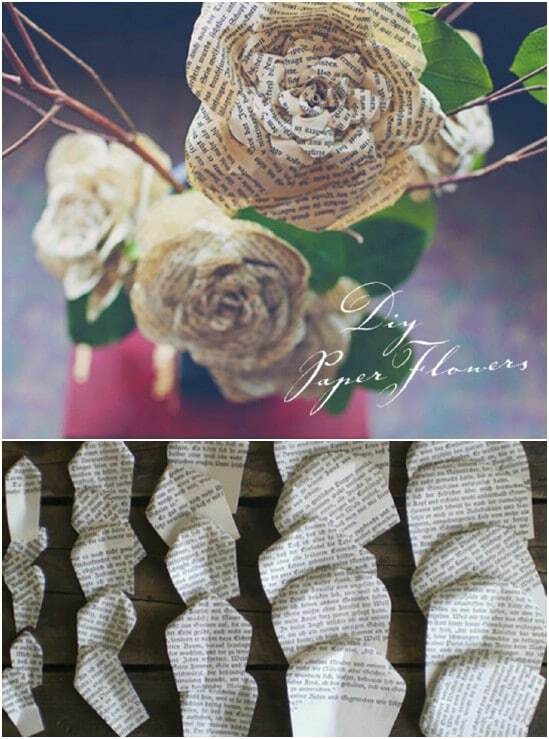 Any old book is going to be perfect for giving you gorgeous book page roses. You could also use new books but old books have that gorgeous yellowing color that is perfect for making these rustic looking flowers. These are really easy and they are perfect for adding a bit of extra design to your DIY rustic farmhouse furniture and décor. They also make wonderful gifts.